In this question type candidate is given a scenario based on which multiple questions are asked. The given scenario is called the main question, and questions asked based on it are called sub questions. Sub questions can be "Multiple Choice Single Answer" type or "Multiple Choice Multiple Answer" type. 1. Entering a new question : To enter a new question select "Testlet" under "Choose Question Type" in Author/Question Type screen and click on "Add New/Insert". Question : Enter the main question or the scenario in this field. Enter number of sub questions: In this field provide the total number of sub questions that are required for this scenario. Exhibit : This option displays the name of the image file selected by browsing. Explanation : Any explanation for the sub question can be entered in this field. Choices : Total 6 choices (answer options) can be provided for the sub question. Each question must have at least 4 answer options [choice5 and choice6 are optional]. Enter the choices (answer options) in these fields. Correct Answer : Each choice (answer option) is provided with a check box field which can be checked to mark that choice as correct answer for the sub question. "Multiple Choice Single Answer" type question can have only one correct choice (answer) where as "Multiple Choice Multiple Answer" sub question type must have minimum two correct choice (answer). Click on "Save" button to save the sub question. You will be prompted to enter next sub question. Once all the sub questions are entered message will be displayed that question have been entered in database. 2. 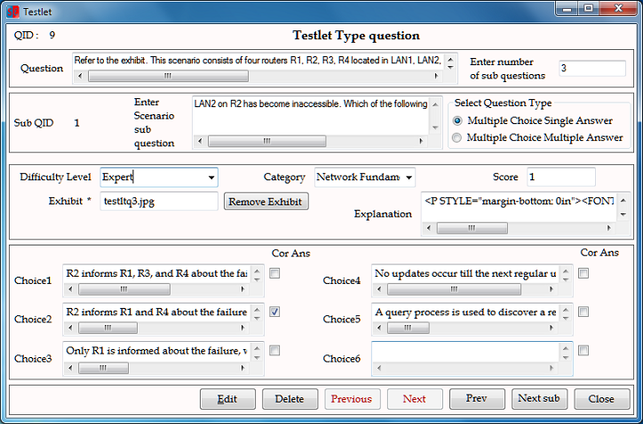 Edit an existing question : To edit an existing question select select "Testlet" under "Choose Question Type" in Author/Question Type screen and click on "Edit/Delete". Use previous and Next button to navigate to the desired question. Use "Next sub" button to navigate between sub questions. Make required changes and click "Edit" button to save the changes. Use "Close" button to exit without saving.